The Context Toolkit aims at facilitating the development and deployment of context-aware applications. By context, we mean environmental information that is part of an application's operating environment and that can be sensed by the application. The Context Toolkit consists of context widgets and a distributed infrastructure that hosts the widgets. Context widgets are software components that provide applications with access to context information while hiding the details of context sensing. In the same way GUI widgets insulate applications from some presentation concerns, context widgets insulate applications from context acquisition concerns. The PersonNamePresence context widget senses the presence of a user and is able to identify her. It relies on a sensor that provides both presence and identity information. In the current implementation, we use iButtons that users snap in a reader to notify their presence. Each button has a unique ID from which we derive the user's identity. 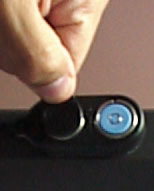 Right: To dock, the user snaps her iButton into the reader. Below: The reader is mounted on Dummbo, an augmented whiteboard for impromptu meetings. 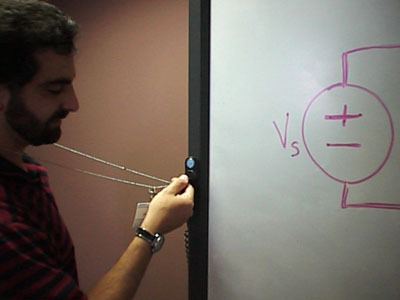 When two users dock, Dummbo assumes a meeting is beginning and starts capturing audio and whiteboard drawings. A reader is mounted at the entrance of our lab. Whenever we come in or out, we dock our iButton. We have used this presence and identity information to build a simple in/out board. It is standing on the receptionist desk. We also used the web gateway service of the toolkit to provide a web version (#1: CRB, #2: CCB). If we switch to another sensing device such as Active Badges, we will use the exact same application executable. Only the context sensing layer of the widget will have to be rewritten. PhD thesis, College of Computing, Georgia Institute of Technology, December 2000. Anind K. Dey, Peter Ljundstrand and Albrecht Schmidt, Workshop Organizers. Workshop abstract to appear in the Proceedings of the 2001 Conference on Human Factors in Computing Systems (CHI 2001), Seattle, WA, March 31 - April 5, 2001. Anind K. Dey, Jen Mankoff and Gregory D. Abowd. GVU Technical Report GIT-GVU-00-14. Submitted to the 13th Annual ACM Symposium on User Interface Software and Technology (UIST 2000), September 2000. Proceedings of the 2nd International Symposium on Handheld and Ubiquitous Computing (HUC2K), Bristol, UK, September 25-27, 2000. pp. 172-186. In the Workshop on Software Engineering for Wearable and Pervasive Computing , Limerick, Ireland, June 6, 2000. Doctoral Consortium paper in the Proceedings of the 2000 Conference on Human Factors in Computing Systems (CHI 2000), The Hague, The Netherlands, April 1-6, 2000, pp. 79-80. Workshop abstract in the Proceedings of the 2000 Conference on Human Factors in Computing Systems (CHI 2000), The Hague, The Netherlands, April 1-6, 2000, p. 371. Anind K. Dey and Gregory D. Abowd. In the Workshop on The What, Who, Where, When, and How of Context-Awareness, as part of the 2000 Conference on Human Factors in Computing Systems (CHI 2000), The Hague, The Netherlands, April 3, 2000. Also GVU Technical Report GIT-GVU-99-22. Submitted to the 1st International Symposium on Handheld and Ubiquitous Computing (HUC '99), June 1999. Anind K. Dey, Masayasu Futakawa, Daniel Salber and Gregory D. Abowd. In the Proceedings of the 3rd International Symposium on Wearable Computers (ISWC '99), San Francisco, CA, October 20-21, 1999. pp. 21-28. Anind K. Dey, Daniel Salber and Gregory D. Abowd. In the Proceedings of the 1st International Workshop on Managing Interactions in Smart Environments (MANSE '99), Dublin, Ireland, December 13-14, 1999. pp. 114-128. Anind K. Dey, Daniel Salber, Masayasu Futakawa and Gregory D. Abowd. GVU Technical Report GIT-GVU-99-23. Submitted to the 12th Annual ACM Symposium on User Interface Software and Technology (UIST '99), June 1999. Panel at the 1st International Symposium on Handheld and Ubiquitous Computing (HUC '99). Panelists are: Peter Brown (University of Kent at Canterbury), Nigel Davies (University of Lancaster), Pete Steggles (AT&T Laboratories, Cambridge) and Mark Smith (HP Laboratories, Palo Alto). September 27-29, 1999. pp. 304-307. Daniel Salber, Anind K. Dey and Gregory D. Abowd. In the Proceedings of the 1999 Conference on Human Factors in Computing Systems (CHI '99), Pittsburgh, PA, May 15-20, 1999. pp. 434-441. Daniel Salber, Anind K. Dey, Rob J. Orr and Gregory D. Abowd. GVU Technical Report GIT-GVU-99-29. Submitted to the 1999 Conference on Human Factors in Computing Systems (CHI '99), July 1999. Daniel Salber and Gregory D. Abowd. In the Proceedings of the Perceptual User Interfaces Workshop (PUI '98), San Francisco, CA, November 5-6, 1998. pp. 63-66. Georgia Tech Technical Report GIT-CC-00-29. The Context Toolkit now has a user's guide! This contains a tutorial (updated 3/15/00), an installation guide (updated 09/12/00) and source code documentation (updated 2/24/00). The first public release of the Context Toolkit is now available. If you would like to obtain the toolkit, please contact Anind Dey. A maintenance update to the first release is now available.